Sanguine Gas Exploration is a Tulsa based, family run, independent oil and gas company led by Randy Nelson, the son of Sanguine’s founder, Don Nelson, and the grandson of Herman Kaiser, the founder of Kaiser-Francis Oil and Gas. Don Nelson was Exploration Manager at Kaiser-Francis for 15 years prior to establishing Sanguine in 1977. Randy started at Sanguine as a summer intern in 1981 and joined the company permanently in 1991 after working as a commercial credit officer in the New York headquarters of Citibank and completing his MBA. Randy became President and sole owner of Sanguine in 2003. Sanguine has demonstrated an ability to adapt to a cyclical industry that has been continually impacted by technical change. Sanguine’s ongoing success is partly attributed to a lean management structure which allows the company to focus on a few high-impact investments within its Mid-Continent focus area that are sponsored by the Nelson family and management. It also benefits from a top tier, entrepreneurial management team that is “home grown” and has significant tenure with the organization. Most senior managers have spent their entire career at Sanguine. Over its history, Sanguine has served as operator of over 750 drilling wells in Oklahoma and the Texas Panhandle. Over its first 30 years, Sanguine was a leader in the development of deep, over-pressured gas resources within the Anadarko Basin targeting lower Pennsylvanian formations in the Red Fork, Atoka, Morrow, and Springer. 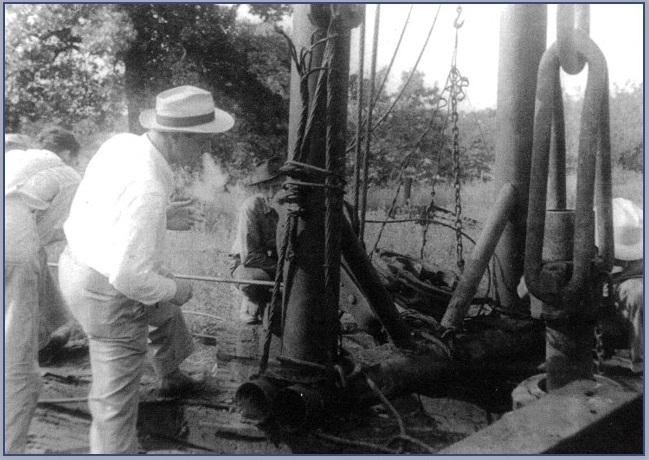 As part of its activity in the Western portion of the basin, Sanguine began, around 20 years ago, shifting its focus to the Pennsylvanian Granite Wash primarily in Beckham County, OK and Wheeler County, TX where it was a pioneer in vertical and horizontal drilling in this resource. Today, Sanguine is the operator of 310 producing wells across the Mid-Continent, 43 of which are horizontal. Through the cycles of the industry, Sanguine has also been active as a buyer and seller of assets. In 2003, most of the then assets of the company, including operated production, were sold to Dominion Resources. The company then divested a package of Granite Wash production and associated acreage to Apache in 2008. In 2017, Sanguine sold undeveloped leasehold in the Arkoma Basin to an undisclosed buyer. On the buy side, in 2016 Sanguine completed a $45 million acquisition of properties from Enervest including 128 operated and 349 non-operated producing wells. More recently, in 2018, Sanguine acquired 44 operated wells along with the associated compression and gathering infrastructure in the Potato Hills field for $26 million. Sanguine’s current strategy is to consolidate mature oil and gas production in the Mid-Continent to benefit from the company’s efficient management and field operations structure along with its expertise in maximizing lower volume production. These properties are a source of long term income for Sanguine and its base of family office investors. As a complementary strategy, Sanguine continues to seek capital appreciation and growth from investments in leasehold and minerals in emerging and established development plays across the Mid-Continent. Randolph Nelson’s maternal grandfather and founder of Kaiser-Francis Oil Co. The Kaiser family flees Nazi Germany to England and then moved to Tulsa, Oklahoma in 1940 where some family members were already settled. Kaiser-Francis Oil Co. (KFOC) was formed by Herman Kaiser and his uncle, Sam Miller. The company began by drilling deeper gas wells in western Kansas. Don Nelson receives an Economics Degree from Yale and an MBA from the Wharton School, University of Pennsylvania. He marries Ruth Kaiser Nelson, daughter of Herman & Kate Kaiser. Don Nelson departs KFOC to start Sanguine, LTD, as a true wildcatter Don launches an aggressive development program, drilling and operating deep gas wells in the Anadarko Basin. Randy Nelson moves to New York and works as a Senior Associate for Citibank. As the son of Don and Ruth, Randolph Nelson pursues a bachelor’s degree from Yale in 1985, a masters in Modern History from the University of Oxford in 1986, and receives a MBA from Harvard Business School in 1991. Randy Nelson becomes involved in the core management of Sanguine, LTD.
Randy Nelson is Sanguine’s exploration manager for modeling and engineering from 1994 to 2002 and works closely with his father Don to learn the ins and outs of the oil and gas industry. Under Don Nelson’s leadership Sanguine is sold to Dominion Corp. and later Don retires. Randy Nelson forms Sanguine Gas Exploration, LLC, retaining the majority of Sanguine, LTD staff. Randy continues the legacy of his grandfather, Herman Kaiser, and father to grow Sanguine through aggressive drilling programs and E&P acquisitions by calculated risk and entrepreneurial intelligence. Sanguine Gas Exploration, LLC focuses on drilling deep gas wells and continues as an innovator in the exploration of ultra-deep dry gas reserves in over-pressured formations from 2003 to 2007. Sanguine begins drilling shallow oil wells, eventually drilling horizontal Granite Wash wells in the Anadarko Basin in 2008. In the aftermath of the collapse of oil and gas pricing, Randy had the difficult decision to either sell the business or change its business model in these hard economic time. Sanguine and their core investors made a $45 million acquisition of long life gas producing assets in the Anadarko Basin, followed by an aggressive leasehold acquisition in the Arkoma Basin. In September of 2017, Sanguine sold approximately 15,000 net acres in the Arkoma Basin. In August 2018, Sanguine purchased 44 active operated wells, along with associated compression and gathering infrastructure in the Potato Hills field in southeastern Oklahoma. Potato Hills is a significant structural feature within the Ouachita Fold Belt. Sanguine is focused on maximizing the value of 310 operated wells and over 2,000 non-operated wells across the midcontinent area and growing through strategic partnerships, acquisitions, and leasehold projects.